Like snowflakes and human fingerprints, no two oil wells are exactly the same. Even though they may be on adjacent plots of land, the characteristics of the wells can be vastly different. Whereas one might have a straight, unencumbered path to the product reservoir, the second’s drilling route may require a number of dogleg turns to avoid difficult rock and sediment formations, which can give the final wellbore the look of a corkscrew. The differences do not end when the product reservoir is tapped. Production companies have long known that oil from different regions can have little in common. That can also be the case for wells in close proximity to each other, with the crude oil’s makeup varying to a significant degree. Therefore, it is critically important that the exploration and production company’s oilfield technicians are intimately aware of the unique operating characteristics of each and every well. This will help them select and deploy transfer equipment—with pumps playing a significant role—that optimizes returns while minimizing costly downtime caused by breakdowns that require maintenance or replacement. No matter where the oil is removed from the ground—be it a traditional wellpad recovering sweet West Texas Intermediate crude or the returns from a hydraulic fracturing setup in North Dakota’s Bakken formation—most crude oil can be defined as a three-phase liquid. This means it features a gas- liquid-liquid formulation consisting of natural gas, water and the crude oil itself. The specific ratios of the gas-liquid-liquid composition that flows up the wellbore will affect its handling, transport, storage and refining. The most critical concern for the operator is the amount of gas present in the recovery stream. This gas is entrained within the fluid flow, and its potential effects on the capability of the entire production and transfer system must be considered before an efficient and reliable system can be built. There are several noteworthy challenges created by the presence of entrained gas in the crude oil stream. The most basic is that any amount of entrained gas can make accurate and reliable flow measurement difficult to achieve. Another operational concern is the chance that cavitation can occur if any of the entrained gas reverts to a liquid form as it is being transferred. This can be especially harmful if the cavitation takes place inside the pump, where the collapsing gas bubbles can strain the pump’s internals and eventually lead to a breakdown. The amount of entrained gas in the oil can also lead to fluctuations in the system’s pumping pressure. If the pressure changes too often or too drastically, the pump may experience a vapor-lock condition that will halt its operation. One production area in the U.S. that has proven to feature oil streams with a high volume of entrained gases is the Bakken formation. 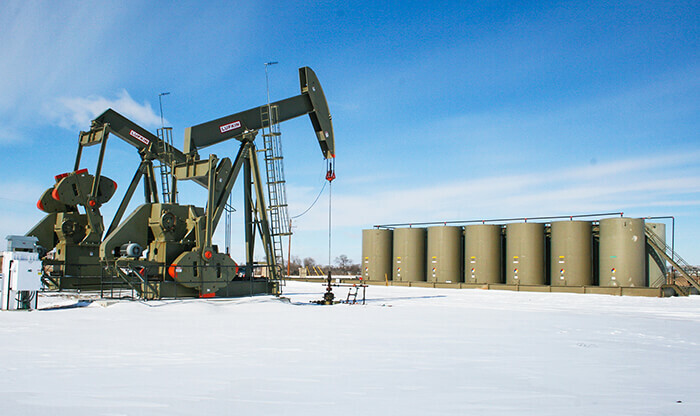 Specifically, Bakken crude is a three-phase liquid in that it is of a light viscosity with a high concentration of entrained natural gas and other components that affect its specific gravity from day to day. These overriding features of Bakken crude require a transfer system in which pumps are used to introduce the gas-heavy oil into a pipeline at the wellhead. From here it is typically transferred through a series of switching stations along the pipeline and delivered to holding tanks before moving along the stages of the refining process. It is a combination of this setup, the unpredictable volume of entrained gas in the oil stream and the level of liquid in the tank battery that will cause inlet pressure changes to occur more frequently. It is these upset conditions, and the pump’s inability to work through them, that can cause it to experience vapor lock. A popular technology for crude oil transfer has been gear-style pumps. However, because of their method of operation, gear pumps will begin to function unreliably if the vapor pressures vary too much, which will hamper the overall efficiency of the pipeline system. Specifically, gear pumps require the proper head pressure in order to produce a constant flow rate. If the pressure varies too widely, vapor lock will take place. Image 2. The design of sliding vane pumps enables them to deliver the operational characteristics that help ensure effective high-volume transfer of crude oil with significant amounts of entrained gases. Faced with the shortcomings of gear pumps that are tasked with handling crude oil with a high volume of entrained gas, oilfield operators were on the lookout for a different type of pumping technology to handle the demands of frequent pressure variations. They found a reliable alternative in positive displacement (PD) sliding vane pump technology. 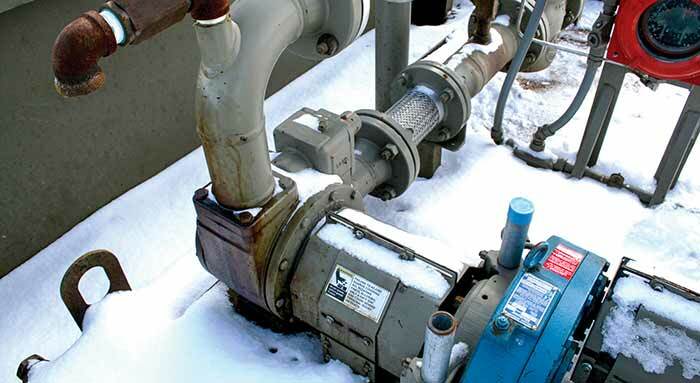 For nearly 115 years, sliding vane pumps have been used in myriad oilfield-based liquid-transfer operations.